As a supporter of school bullying prevention programs for almost 15 years, I am encouraged. 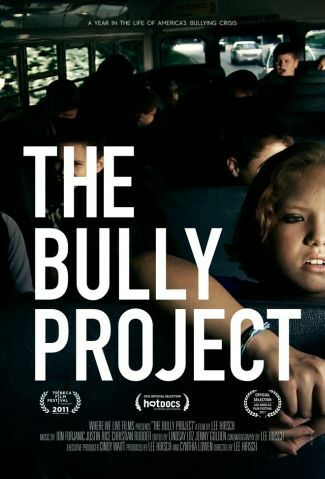 More and more states have passed anti bullying laws, more school systems have begun implementing programs, the reception of the documentary “Bully” has been overwhelming, and we’ve finally collectively decided that the “kids will be kids” excuse isn’t working anymore. As thirty percent of students in the United States are involved in bullying on a regular basis either as a victim, bully or both and over 13 million kids are suffering from bullying, the movement needed to happen, and it needs to continue. Thankfully, as the “Bully” team went through the process of making the documentary, we found fierce advocates. They came from everywhere. Kids, parents, teachers, the media, celebrities, and Congress on both sides of the aisle stepped up and spoke out. But, where are we when the mirror turns to us big kids? I’ve found less support there, and it doesn’t surprise me. It’s harder to turn the spotlight on ourselves. 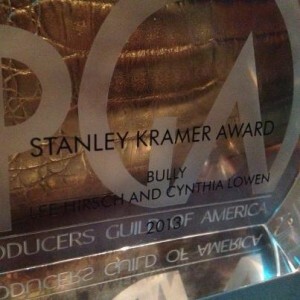 A Huffington Post piece I did in October, 2012, called “Who Did You Bully today?” http://www.huffingtonpost.com/cindy-waitt/who-did-you-bully-today_b_2006802.html, made the point that until we stopped bullying each other, we won’t see the results we want to see from our kids. I named multiple sectors of adults (including me) who bully, from the home (the first role models kids have, and the most important place to stem violence), to the workplace, to Congress, to cyberspace, and yes, the constant, mind numbing barrage of reality shows. A lot of these big boys and big girls in all of these places continue to not only not be kind, but to be brutal to each other on so many of our adult “playgrounds and school yards”. I’ve written about the link between violence in the home and violence in school, and the data backs it up. But, as the workplace, for us, is similar to our schoolyard, where we interact, socialize, work, play, learn, grow, and spend much of our waking hours, I decided to check into that again and see just how we are doing. It’s not good. 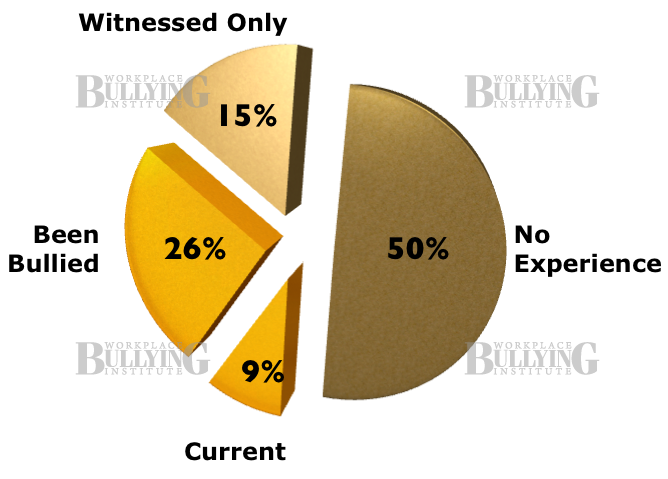 As you can see above, 35% report being bullied at some time in their work life, and another 15% witnessed it. Putting the numbers together, WBI says, with a well place exclamation point, “An astonishing 54 million Americans directly experience it!”. I get the exclamation. That’s abysmal news. 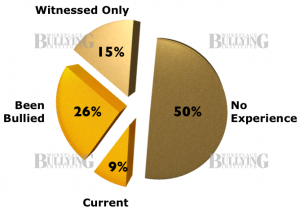 The Waitt Institute for Violence Prevention actually co-sponsored the first national survey with WBI and Zogby in 2007, and those results were similar, and disheartening. “Bully” explores the mental, physical, and emotional toll on the victims and their families. It’s hard to watch Alex being brutalized, and the despair of the Longs and the Smalleys, who suffered the cruelest loss-the suicide of their children. We don’t have a film like that to show damage from the workplace, but it’s there. The late Tim Field, an early advocate of workplace bullying prevention, said, ” Nothing can prepare you for living or working with a sociopathic serial bully. It is the most devastating, draining, misunderstood, and ultimately futile experience imaginable.”. Here’s a slice of what it looks like, according to WBI. Is this happening to you, or someone in your workplace? Is driven by perpetrators’ need to control the targeted individual(s). Undermines legitimate business interests when bullies’ personal agendas take precedence over work itself. It’s real, it’s pervasive, and all of it needs attention, just as we’ve started attending to our kids. I have hopes that the current school age generation may learn early what we adults haven’t. I also have hopes that because of the anti school bullying and violence prevention movement, we can give today’s children the social and emotional tools to recognize bullying in themselves and in others. But, if we continue to treat each other this way, wherever we interact as grown ups, can we continue then to expect more from our kids? Let’s learn to model respect, kindness, and decency. Kids watch us, they listen to us, and we can make a difference. But, let’s look in the mirror first, and go from there . For more information, visit these sites….